At Cold Spring, join local Magic the Gathering players in a sealed draft tournament to win cards and prizes, 6-9 pm Thursday, Nov. 29. Ages 17 & up; registration required. At Carrico/Fort Thomas, teens can Celebrate World Kindness Day with the Campbell County Animal Shelter at 4 pm Tuesday, Nov. 13, and earn community service hours. Also at Carrico/Fort Thomas, Deanna Beineke of the Fort Thomas Military and Community History Museum presents Exploring Local History: The Early Military History of Fort Thomas, 7 pm Thursday, Nov. 15. At Newport, Phoenix Wilson presents two wellness programs, Chair Yoga, 12:30 pm Thursday, Nov. 8; and T’ai Chi, 12:30 pm Thursday, Nov. 15. Register separately. Also at Newport, Bluegrass star Dale Ann Bradley returns 7 pm Friday, Nov. 9 as part of our Signature Series. Free tickets required in advance. At Alexandria, ages 6 & up are invited to Pokémon Club, 4 pm Wednesday, Nov. 14. 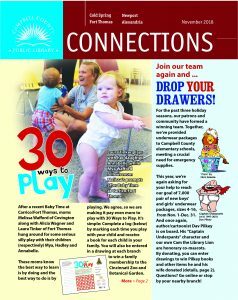 Read about all that and much more in the November “Connections”.